The DODFX55b is like the Boss DS1. Almost everyone has bought one when starting up guitar, and almost everyone despises its tone shortly after for pretty good reasons. Not all DOD FX series pedals are bad but they all suffer from a pretty poor switching design. On top of this, the FX55b packs as much punch as a wet blanket, has a useless tone control and has less tone than a Dyson hoover. Piece of crap? Yes. The one I was given was in a pretty poor state and wasn't worse reselling, so I modified it into a usable overdrive. It surely doesn't beat my standard tubescreamers but it comes a lot closer to their tone than it did in its original form. The aim of the mod is simple: by changing the voicing of the first driving stage, the tone control is now more effective and we get a bit more output level. The tone is now beefier with more lows and mids, and less piercing highs. It is now possible to go from a mild TS-style overdrive, up to a heavy saturation. The only remaining problem is that the more you increase the gain, the more the bass end is attenuated. I personally prefer the opposite. 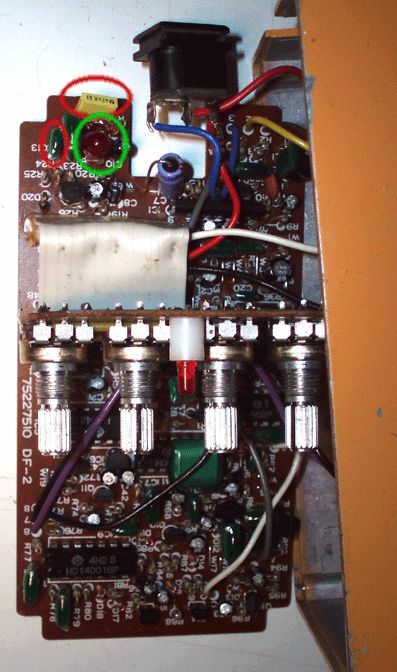 To counteract this, you can remove the 3.9M resistor, replace the gain pot with a 1M potentiometer, and reconnect it just like on an Ibanez Tube Screamer. The PCB allows this simple modification. Also, by playing with the values of C11 and C12, it is possible to change the range of the tone control. Have fun! The following mod is extremely simple and has the advantage of curing both problems with only one component. 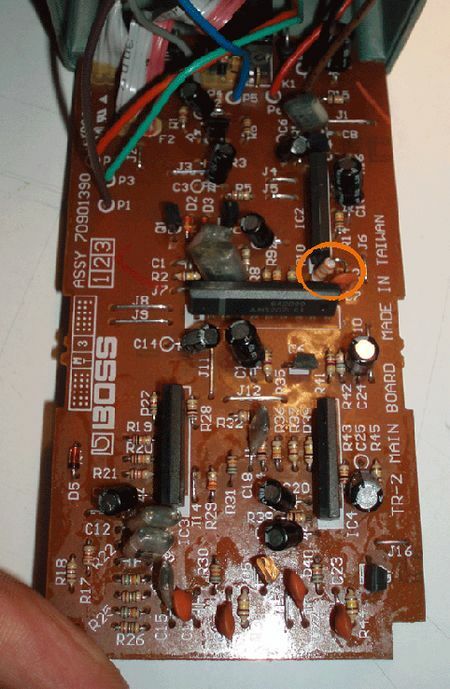 All there is to do is find the R8 resistor (1), unsolder it gently to avoid damage to the board (use unsoldering braid or a cheap solder pump), and replace it with a 22kOhm resistor (red-red-orange). That's it! The sound is now a lot thicker with more low mids and bass (but not too much). The output of the pedal is also a lot greater: even with Over Drive on 0, the volume gain is above unity. The pedal is now ideal for slamming the input of a crunching amplifier, or for adding just a bit of dirt to clean parts. It is possible to get more bass out of the OD1 by upping the value of that resistor. However, too much bass is couterproductive for an overdrive pedal as the tone can quickly become mushy: therefore, try staying below 33kOhm (orange-orange-orange). For a grittier overdrive, try replacing the D5 and D6 diodes (3) with red LEDs. You'll also get more output that way. Again, respect the diodes polarity when swapping them. The Boss TR2 was fast becoming a well-respected standard before the boutique pedal makers flooded the market. It is still present on many pros pedlaboards. It's most famous problem is the slight volume drop when engaging the effect. It isn't so much a problem if you are playing with a clean amp that compresses a lot, but in most application it is an annoyance. There are many mods on the web to remedy this, but I fell my mod is not only simple, but very effective, while totally preserving the modulation wave shape. 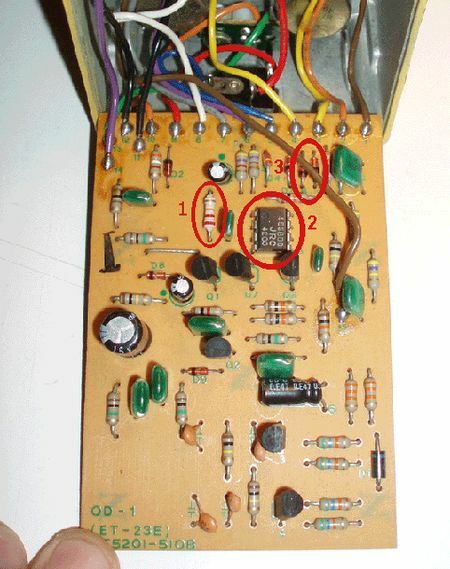 By changing the R12 resistor from 22kOhm (rouge-rouge-orange) to 33kOhm (orange-orange-orange), the level of the tremolo is upped, thereby avoiding the guitar to be lost in the mix when switching the effect on. You can even give it a slight boost by using larger values for R12, but it will be at the expense of the background noise levels and headroom. The Boss "Super Distortion & Feedbacker" or"Super Feedbacker & Distortion " (it has been called both) is one of the strangest Boss pedals. The manufacturer generally puts out conservative designs but it has gone wild with this one. When you keep the pedal depress, a mono synth creates a note corresponding to the one your playing, wih a bit of vibrato, thereby creating a fake feedback which in certain occasions can fool the listeners. The pedal creates some run-of-the-mill distortion sounds that are just usable. That part of the circuit is actually very similar to the ubiquitus DS1. furthermore, even with minimum gain, the drive level is quite high, and it is difficult to use the fake feedback while preserving the tone of the amp. To make the pedal give a cleanish tone, and a more natural overdrive, we will first replace D3 with a red LED: careful with the polarity! We will then unsolder one end of D2 and connect a germanium diode (a 1N34 fro exemple) to it. Follow the illustration below. Again respect the polarity or it won't work properly. Solder the remaining free end of the germanium diode on the board, where D2 was unsoldered from. The tone is now more natural, less compressed and with more clarity when playing complex chords. It is now also possible to get cleaner sounds. As a result, the pedal can be used in front of a distorted amp to get a great sounding "feedback" note at any time. 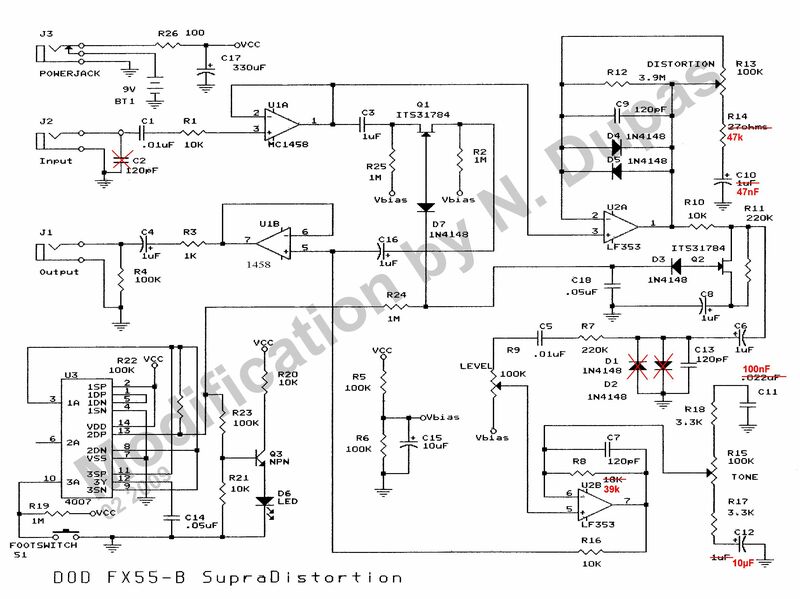 Just like the DS1, the tone of the DF2 has a dip in the mids: great for bedroom use but not ideal in a hard rocking band context.To avoid being lost in the mix when engaging the pedal, we can sub C12 (100nF, circled in red) with a 47nF capacitor. This has two effects. Firstly, the low mids are now more present, giving a fuller, warmer tone. Secondly, the dip in the mids is lessened allowing the guitar to be more present in a band context, without the need to turn up. At low volume, the tone stays very good, so bedroom players don't sweat!To completely remove the notch in the mids C13 (22nF circled in red) can be replaced by a 47nF cap. All the mids are restored and the tone control is still perfectly usable. All these mods can of course be performed on the Boss DS1. By putting the gain control on zero, it is possible thanks to these mods to obtain quite a transparent sound form the pedal. The drive tones from you amp(s) can be used instead of the pedals more synthetic tones and the fake feedback effect will also blend better into your sound.For more unconventional sounds, unsolder D2 and D3: you can get feedback on a clean tone! 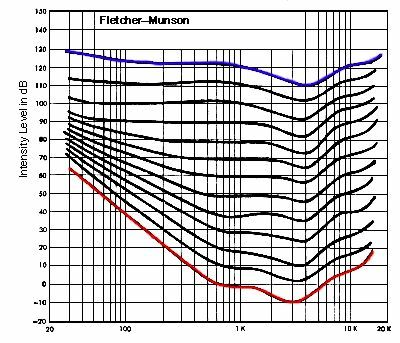 FLETCHER-MUNSON: keep that V-shaped EQ for the bedroom! Why does a V-shaped equalization seem to give a "big" sound? Why is it necessary to use a bigger amp for the bass than for the guitar when gigging? Why do some amps have a bright switch when you could just turn the "high" knob up? The answer to all these questions (and more) is very simple and lies in a few curves. And you don't even have to be a rocket scientist to understand them! The Fletcher Munson curves date back to the 1930s and were traced by conducting many earing tests. They indicate for each frequency how much acoustical pressure is needed for an equal loudness. To put it simply: each curve indicates how much energy you need to make each frequency heard at the same level. These curves show that not only does the necessary energy (or power) needed for equal loudness changes with the frequency, but also that this variation varies with the sound level! Looking at the red curve, we can see that a pure 100hZ tone needs a level of 40dB to be heard at the same perceived level as a 1kHz tone at a level 0db. If we look now at the blue curve, we note that a 125dB level is needed at 100Hz to hear it as loud as a 4kHz at 110dB. 1. At low volume, it is necessary to turn the highs and lows up to hear them at the same level as the mids. 2. The higher the volume, the better we comparatively hear the highs and lows, although still not as well as the mids. When we play at low volume with a flat EQ, we mainly hear the mids. By turning the mids down, not only do we ear them better (principle 1), but we trick the ear into thinking that the music is played loud even though the level remains the same because the music's frequency curve now resembles the one we would have if we played the music louder (principle 2). Why is it more satisfying to play guitar with a loud amp than quietly? The answer is similar to the previous one. When we increase the volume on the amp while keeping the same EQ settings (with a good amp of course), we get the impression that the highs and lows become louder comparatively to the mids (principle 2): the tone seems "bigger" (thanks to the more prominent lows) and more detailed (thanks to the more prominent highs). We can see that whatever the sound level, we never hear the lows as well as the mids (principles 1 and 2). It is therefore necessary to use more power for the bass in order to make it perceived loud enough (as loud as the guitars for ex.). Nowadays, it is often used to create a special effect, but the first aim of that switch was to compensate for the perceived lack of highs at low volume with a very low parts count (principle 1). Compensating the lack of lows is a much more complicated task necessitating a proper dedicated circuit so this is very rarely implemented on amplifiers. But hi-fi equipment and car stereos often have this feature: it is often called "Loudness". Many other questions find their answer in these two principles. For discussions sake, it is also interesting to note that the human voice register spans across the medium frequency range: pure hazard or illustration of the Darwinian evolution theory? The Laney PA100 is an old compact PA system that really has no use anymore for sound reinforcement purposes. But it constitutes a good clean amp for bass. Its preamp are standard fair with two common cathode gain stages around a Baxandall tone circuit. The mixing stage is quite primitive and the phase splitter is preceded by a somewhat useless cathode follower. Nevertheless, the amp behaves as it should with a neutral and fairly clean sound (until you turn the volume high up). Here is its schematic. 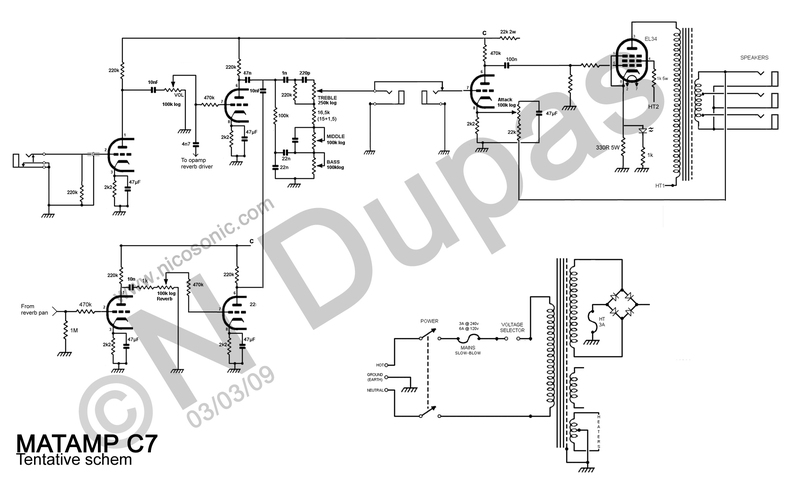 Modern Matamp schematics are very rare on the web. It's a shame because their design are quite unique if not revolutionnary. The Matamp GTO, also known as the series 2000, has varying features. Some offer a 3 position Depth control and a 4 position Drive control, while some others have a 4 position Depth control and a variable Drive. The following schematic is for an amp of the first kind, but it is easy to extrapolates as to how the second variant is built. _ lastly, the output stage is of the "cathode bias" type with no global feedback. It is not so common with EL34s and this must contribute to the unique tone of this amp. _ the tonestack design is taken straight out of a Hiwatt Custom, although the identified values are different. This kind of tonestack isn't very efficient in a Hiwatt (at least the ones I have played including mine), but it is very powerful in Sound City amps. _ the power tube cathode resistor doesn't have a bypass cap: I haven't tried this in my builds but I assume that the result is reduced power output (as in "not increased") and some kind of compression effect. _ the Attack control is an improved "presece" control: it gives a kind of cut when the wiper is close to the global negative feedback resistor, and boost when the wiper is on the other side. Again, smart. Except for a few niggles, these Matamps are very well made (better than the ones from the 90s actually). They look good, sound good, will probably last along time and are priced more competitively than many of their competitors. Here is the schematic for the SL60 and HR50. You may have found one for the Hot Rod already but it contains many big errors. These two amps are pretty similar since the Super Lead 60 is the big brother of the HR50. 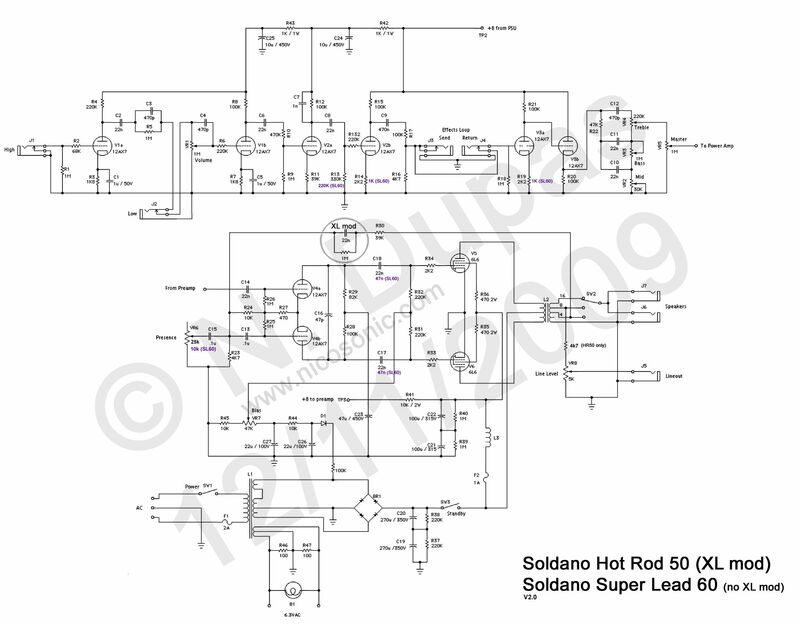 The differences between them are indicated on the schematic and I have also included the famous "XL" mod by Soldano. Here are a few simple mods I did on mine. Stock, they sound pretty bad and can therefore be had for cheap. The following mod will litterally transform this pedal. The pedal is now closer to a FF clone with buffer, and it has all the qualities of a standard FF: it cleans dramatically when rolling the guitar's volume knob down, and chords stay pretty well defined even at high fuzz settings. It also goes from a pretty good overdrive to heavy fuzz. I actually like the stock tone control as it has no effect in its middle position and gives usable variations on either side.